Lyft’s share price has plunged more than 20% since debuting on the Nasdaq on Friday. Icahn’s stake was valued at roughly $550 million at the IPO price of $72. Carl Icahn sold his roughly 2.7% stake in Lyft ahead of last week’s initial public offering, The Wall Street Journal says, citing people familiar with the matter. No buyer was reported. While the motivation of Icahn’s sale was not announced, the activist investor may have been put off by Lyft’s 2018 operating losses of nearly $1 billion and a dual class share structure which gives the founders Logan Green and John Zimmer de facto control of the company despite holding a minority of shares. Under the structure, the founders have 20 votes per share while other shareholders have one vote per share. Icahn invested roughly $150 million in Lyft in 2015 when the ride-hailing firm was valued at $2.5 billion. While the exact price at which the sale occurred is unknown, Icahn has likely realized a significant gain given Lyft’s $24 billion valuation when it went public. The stake would have been worth $550 million at the IPO price of $72 a share. Lyft’s pre-IPO investors, including the founders, are subject to a lock-up which prohibits the sale of shares for 180 days from the March 28 IPO date. 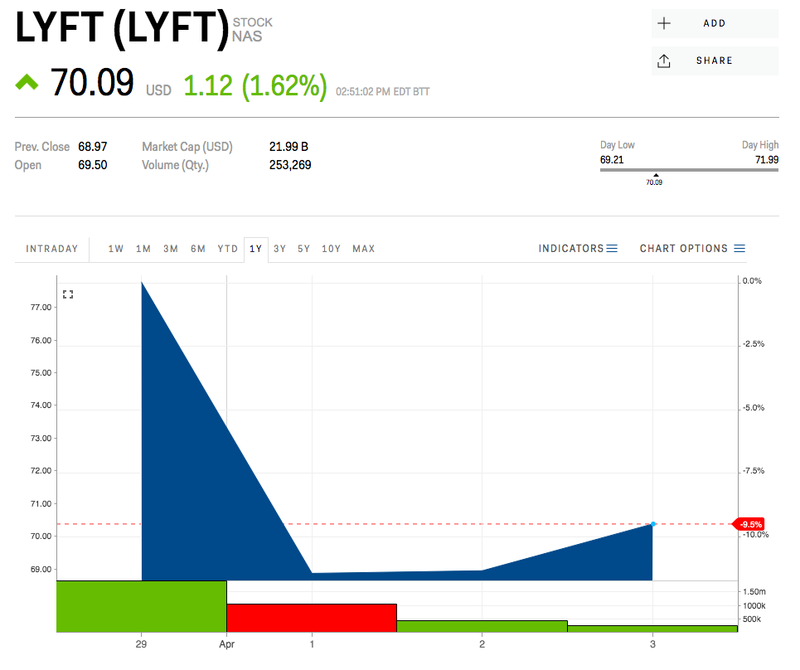 Lyft’s early trading has been choppy as short sellers have mounted a massive bet against the company. Analysts have expressed concerns about the company’s valuation despite the significant growth potential of the ride-sharing industry. Shares were down 20% from the $87.24 where they debuted on Friday.